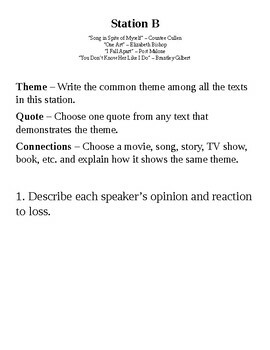 -Each station has students find a theme, quote, and connection. Some stations ask additional questions. This is a Word document, so you can add extra questions to the directions and answer sheets if you'd like. -Songs are from Ariana Grande, Ed Sheeran, Brantley Gilbert, Post Malone, Juice Wrld, Andra Day, etc. -Poems are all American Literature poems from Maya Angelou, Emily Dickinson, Countee Cullen, Langston Hughes, etc. 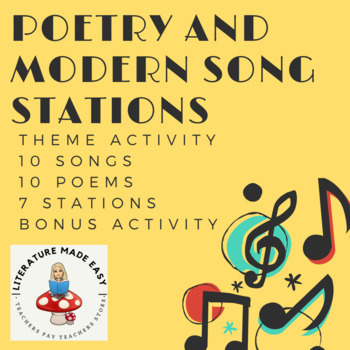 -For each station, I included station directions, QR codes for clean YouTube videos for students to listen (headphones recommended), and lyrics. 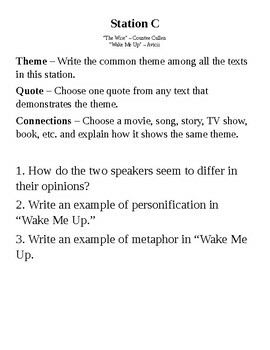 -Have students find their own song and poem to analyze! -Some songs have explicit swear words. I used the songs in an 11th grade class and printed the lyrics without the swear words and the video versions provided are all clean. There are enough songs you could take off the ones you're uncomfortable with. -Because of copyright, I could not include the lyrics and poems. I could, however, include links where I found the lyrics, poems, and clean youtube videos. If you find that any links don't work, you could find them elsewhere or message me, and I'll update my product. 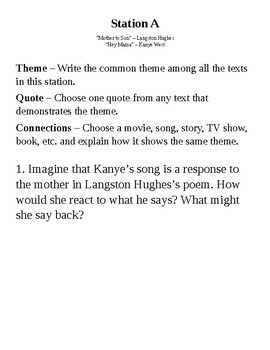 Because of this, you should be prepared to copy and paste the lyrics and poems and print them, or post the links for student access. -Stations took my students 2 40 minute class periods. -Students found their own poem and song on a 3rd day.